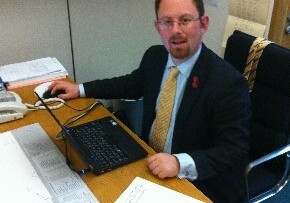 MP Julian Huppert is celebrating victory after news that the government is set to overturn powers which could allow websites to be blocked for allegedly breaking copyright laws. Labour rushed the Digital Economy Act legislation through in the dying days of its government and sections 17 and 18 allowed websites to be blocked if they might carry pirated material – even if they in fact hadn’t. But today (Tuesday, September 25) Julian discovered from a government official at the Lib Dem conference in Brighton that the government is to repeal those parts of the law. Julian said: “This is fantastic news. I have been fighting for three years to get this legislation overturned. It threatened to deny freedom of expression, competition and innovation. Julian led a Facebook fight ‘Lib Dems: Save the Net’ and received full support from the Lib Dems for an emergency motion before the last election, to take a stance against these parts of the Digital Economy Bill. But with massive Labour support the bill was passed, despite Lib Dem opposition. Congratulations Julian, and I hope this is followed through. Constraints on public spaces of all kinds have been mounting and need to be curbed. Not just in the ‘Cloud’, but also on our streets and parks.